PopUps are created with just a script, a link, and a div. A live, working demo is shown on the post. 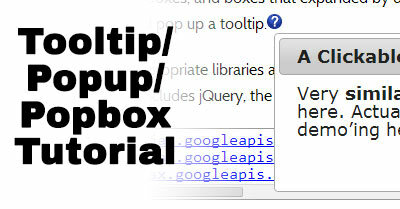 Have you ever had trouble creating popup “tooltip” boxes? You’ve seen them, the ones that explain something about whatever it was you just clicked on. I recently added some to a project of mine, and had a tough time finding documentation on how to add multiple tooltips to the same page. Hopefully this post serves as a reference for someone else looking to do the same! I knew this was a simple javascipt task, but I needed an example to riff off. All the examples I found were muddy and generally unhelpful. Then, I discovered that the jQuery library already has this functionality built-in! The jQuery documentation even has a demo page that kind of explains what I was going for. Unfortunately, the demo page wasn’t comprehensive. It gave me examples of form completion type boxes, and boxes that expanded by default, but I wanted a clickable image that would pop up a tooltip. The first step is ensuring that the appropriate libraries and supporting files are being loaded into the header of your page. That includes jQuery, the jQuery UI, and the accompanying css. If you’re using a CMS such as WordPress or Joomla, they have their own ways of loading these scripts. First, use this example on a simple test page to understand the mechanics. Then, transfer the appropriate code to the live version of your website when you’re ready. Next, the popboxes are crafted. These are div elements that are identified similarly to the tags. One convenient thing about this method is that since the javascipt controls when and where these divs pop up on the screen, it doesn’t matter where the divs are inserted in your code. I personally found it easier to clump all my popbox divs together toward the end of my code. The code above defines the visibility behavior of the divs, but code is needed to tie specific tooltip links to specific divs. Once again, we’re using the class we previously established (popbox_link in this case) and extracting the numerical identifier off of the link id. That id number is then concatenated to the popboxID. The positionDialog function is called. We could forego using the positionDialog function, but in doing so, every popbox will open in the middle of the screen. That’s appropriate for a warning dialog, but doesn’t really work for this purpose. We need to locate the box in close proximity to the link that opened it. This function is self explanatory, but it establishes where the link is located on the screen. It then opens the opens the tooltip and offsets it slightly under the link. Lastly, a couple lines need to be added to the script to make sure the code triggers. To wrap this up, here’s the full script. Looks like it should be pretty simple, right? Right. Very similar to what I’m demo’ing here. Actually, it’s exactly what I’m demo’ing here! I’m actually not sure if I’m using the term triggers correctly here.